Welcome to Bill's Mill of Jacksonville Florida! I'm the guy who runs Bill's Mill Portable Sawmill Service. We are based in Jacksonville, Florida and serve northeast Florida. 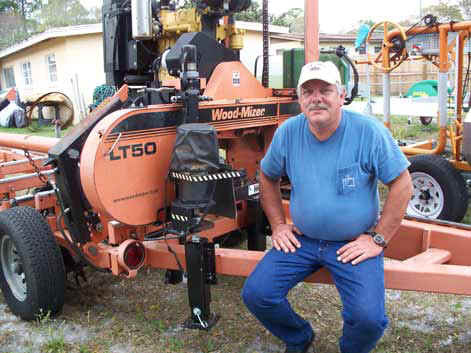 No need to figure out how to bring your logs to a sawmill. We will set up one of our mills on your site. Working closely with you we'll do our best to produce the highest possible quality lumber from your trees, to your specifications, whether you have one log or hundreds. Hardwood or softwood, boards, decking, blanks for woodturning, furniture stock, beams... The possibilities are endless! In many cases even the scraps are useful. Some wood scraps are great for smoking meat or fish. Sawdust and bark can be composted. And there's always the leftovers to use for the fireplace, or that backyard firepit. I have always hated to see quality logs cut into firewood or carted to the curb to end up in a landfill. Worse still, just left laying to rot. Instead, why not use it for a project that will give you satisfaction for many years? We can help in one of the first steps of this process. We are not a tree service. We do not cut trees, grind stumps, clean yards, etc. We do not sell lumber. We do not buy logs. We simply saw your logs into your lumber. In order to accommodate homeowers as well as larger outfits, we are available on weekends as well as weekdays. Depending on the job we may even be willing to start late to let your neighbors sleep in!